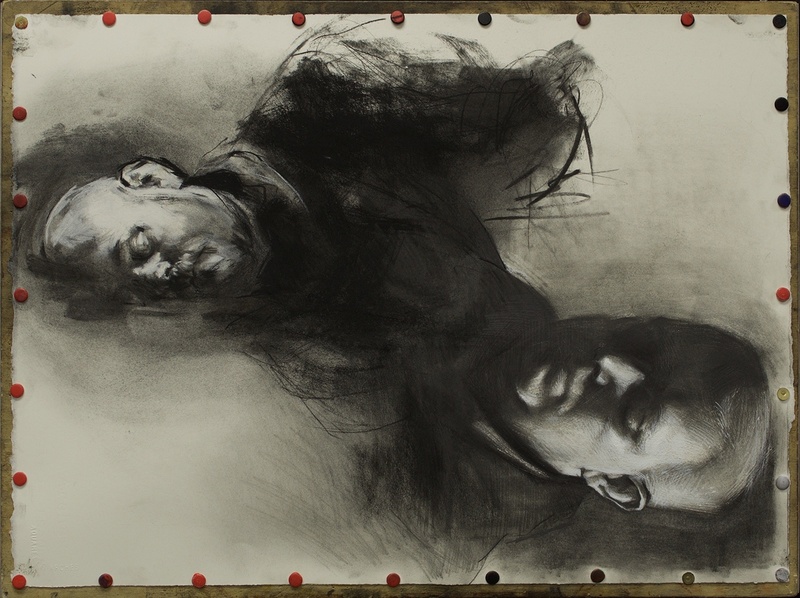 Evan Kitson, a member of Pennsylvania College of Art & Design's fine art faculty, is participating along with fellow Lancaster artist Jeff Geib in REGARD, An Exhibition of Reciprocal Portraits, at the Meredith College Weems Gallery, Raleigh North Carolina, The exhibition includes two drawings drawn by both artists, each a combined portrait where each artist draws the other. REGARD is a national exhibition of reciprocal portraits. The juxtaposition of these fifteen pairs artist explore connections, memories and the bond they share. Each artist pair describes their relationship between themselves and their fellow artist, through formal decisions and processes to create an image of one another through drawing, painting, mixed media, photography and video. These were some of the most difficult drawings I've ever done, and because of that some of the most rewarding. Jeff Geib and I worked on the same sheet of paper, alternating orientations as we worked, switching from the model chair to the draftsman's chair more or less intuitively. Jeff was my first serious drawing instructor, and getting to work with him on a project like this, especially on the same sheet of paper, is an honor. This exhibition allowed me to explore the empathetic relationship of being a model and artist, listener and inquisitor. Chasing the likeness of Jeff as well as the ever changing likeness of the natural light and space, all while reacting (or trying not to react) to Jeff's drawing of me on the surface, proved to be incredibly difficult. I felt as if I was a diagnostician, often changing mediums or approaches in an effort to aid in what I viewed as symptomatic moments in my drawings. I like to think of my work as artifacts of my perceptual experience and process, and these two drawings, fixed in an incredibly raw state, embody that immensely. Unlike most of my work, these two drawings also carry an unmistakeable index with them of two serious draftsman having a great time in the studio, sharing incredibly rewarding conversations while engaging in what we've become to find as a life-defining activity: drawing. In addition to teaching at PCA&D, Evan Kitson is a graduate of PCA&D, class of 2010. He received his Masters of Fine Arts from the New York Academy of Art. His work can be viewed at http://evankitson.com/. Jeff Geib, a long-time contributor to the Lancaster County art scene, is a former instructor at PCA&D and is a member of the Echo Valley Art Group. His work can be viewed at the Lancaster Galleries. REGARD will be exhibited January 13 through February 12, at Meredith College's Weems Gallery in Gaddy-Hamrick Art Center, 3800 Hillsborough St., Raleigh, NC. Hours are Hours: Monday through Friday 9 a.m. – 5 p.m., and Saturday and Sunday 2-5 p.m. The Opening Reception will be held January 26, 4:30– 6:30 pm, www.meredith.edu/gallery gallery@meredith.edu Tel: 919 760 8332.